Last month’s passage of a law to ban all remaining ‘legal highs’ unless they have been proved harmless and the outlawing of testing of such drugs on animals has encouraged us to feature two stories, one on Animal welfare and rights and the second on the history of Drugs. The animal rights story is fresh off the block. Its origins are an interesting example of how Te Ara responds to the wider New Zealand audience. About a year ago we launched our entries on Daily life, sport and recreation. They were generally well received, but a member of the Greyhound Protection League was concerned that we had not presented the full story of greyhound racing. He argued that some greyhounds suffered real abuse after their days of racing were over, and that our story on Horse and greyhound racing should cover that issue. In the end we decided that the racing story should stand, but the interaction forced us to accept that the fascinating history of animal protection was lacking in Te Ara. We had an excellent entry on Pets, but not one that adequately explained the history of efforts to protect animals from abuse. So Nancy Swarbrick, who had written the pets story and had just published an outstanding book on pets, agreed to research and write the piece. It makes for an intriguing read. As with so many New Zealand movements and institutions, the local story begins as a pale echo of larger, more organised movements in the United Kingdom and the United States. Almost 60 years after the SPCA was established in Britain, societies were set up in New Zealand’s main centres. As in the old country, they were concerned with blood sports, the conditions experienced by working horses, dangerous modes of trapping pests and cruel forms of farming. But it was interesting that in the small towns and rural townships where farm life was centred, the movement was nowhere to be seen. Almost a century later a new radical movement began overseas. Once more there were ripples here, with a number of organisations sparked by the international animal liberation movement. More recently, however, the radical animal liberationists have come closer to home, and tackled issues that are important to both New Zealand farming and the economy, such as battery-farmed hens and the crating of pigs. Animal rights are beginning to have a distinctive New Zealand story, as one might expect in a country where farming and the growing of animals are so significant. The Drugs story was first launched last year, and it also tells a history of overseas ideas slowly becoming domesticated. In the 19th century, following British practice, cannabis and opium were freely available and present in many patent remedies. When in the early 20th century restrictions on opiates and cannabis began, this was almost entirely the result of international pressure. It was not until the later 20th century, as drug-taking became more established in New Zealand and distinctive patterns of drug-taking emerged (little use of opium and cocaine and much use of amphetamines and party pills), that domestic pressures for restrictions emerged. So the latest law is but another example of New Zealand politicians at last responding to distinctive local issues in their own way. These two entries help to explain why this is the case. Māori Language Week runs from Monday 1 July through to Sunday 7 July. 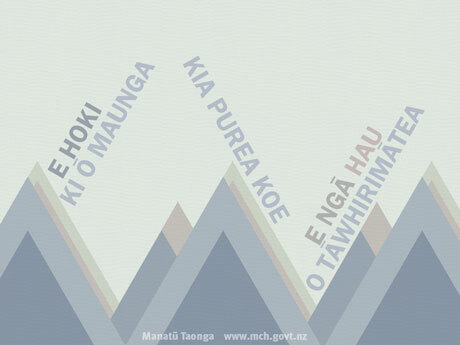 The theme of Māori language week this year is ‘Ngā ingoa Māori – Māori names’. Before noting what new things Manatū Taonga – Ministry for Culture and Heritage is doing this week to celebrate this year’s theme, I’d like to showcase three stories that Te Ara has just released in Māori as well. Traditional Māori religion – ngā karakia a te Māori; Māori prophetic movements – ngā poropiti; and Rātana Church – Te Haahi Rātana. Two other featured entries this week have also been specially selected for Māori Language Week to fit in with the theme of Māori names. One, Tapa whenua – naming places, talks about the way that many Māori place names originated. Also featured is Matariki – Māori New Year, which has been visited heavily and explains the meaning of Matariki. We have had other launches based around this year’s theme: on Monday, reflecting peoples’ names, Manatū Taonga launched six new Quick Read eBooks featuring biographies of significant Māori leaders from the Dictionary of New Zealand Biography (DNZB). Each eBook is published bilingually in Māori and English. Also still available for download is an eBook of all the DNZB biographies in Māori, collectively known as Ngā Tāngata Taumata Rau. At the end of the week, on Friday, we’ll be launching a list of 1,000 Māori place names and their meanings. Finally, I must mention the ever-popular Māori Language Week feature on NZHistory. Particularly popular at the moment is the list of 100 Māori words every New Zealander should know. Ka tīmata Te Wiki o te Reo Māori i te Rāhina, 1 o Hōngongoi, ā, ka mutu a te Rātapu, te 7 o Hōngongoi. Ko te kaupapa o te wiki o te reo i tēnei tau ko ‘Ngā ingoa Māori’. Kei te whakanui a Te Ara i ētahi kōrero mō te wiki nei. E toru ngā kōrero katahi anō ka whakamāoritia: Ko Te Haahi Rātana, ko Ngā poropiti, ko Ngā karakia a te Māori anō hoki. Ko Tapa whenua tētahi e pā ana ki te pūtake o ētahi ingoa wāhi. Ko tētahi anō ko Matariki, kua maha ngā manuhiri ki taua whārangi i tēnei tau. Me tiro anō te kaupapa o te wiki: i te Rāhina kua pahure ake nei ka whakarewangia ngā ī-puka e ono nō Ngā Tāngata Taumata Rau. Kei ngā reo e rua ngā pukapuka nei. Waihoki, tērā te ī-puka kei roto ngā haurongo katoa i roto i te reo Māori. Ko Ngā Tāngata Taumata Rau. Ia rā, ia rā kei te whakanuia tētahi whakaahua. Kei tēnā whakaahua, kei tēnā whakaahua tētahi whakataukī e pā ana ki tētahi atua. Ko te whakaahua tuatahi, e pēnei nei, ‘E hoki ki ō maunga kia purea koe e ngā hau a Tāwhirimātea’. Hei te Paraire, ka whakarewangia te kaupapa 1,000 ingoa wāhi. Ka whakamārama ake i te tikanga o tēnā wāhi, o tēnā wāhi. Ka whakaaturia i ngā mahi a Te Manatū Taonga i te wiki nei, engari, i te tuatahi me tautoko i tētahi kaupapa o mātou. I ngā wā katoa, kei te tirohia te kaupapa wiki o te reo Māori i runga i NZHistory. On Wednesday 6 February we will once again commemorate Waitangi Day. Our sister site NZHistory has a comprehensive feature on the day. The feature suggests that on Wednesday there will probably be protests, speeches, drama, laughter, tears and theatre. And, whatever happens on Waitangi Day, it will be an interesting day. Waitangi Day is a national holiday commemorating the signing of the Treaty of Waitangi on 6 February 1840. 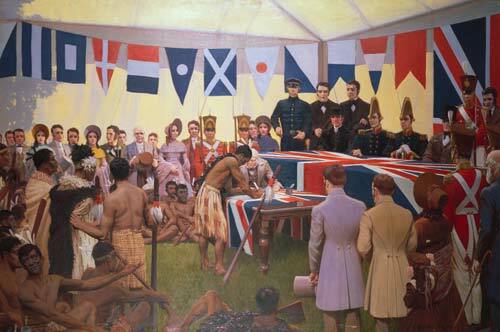 The treaty was signed between Māori chiefs and representatives of the British Crown. A number of these chiefs had earlier been members of the United Tribes who had signed the Declaration of Independence. There were a number of other signings after 6 February on various sheets. All but one were in Māori. 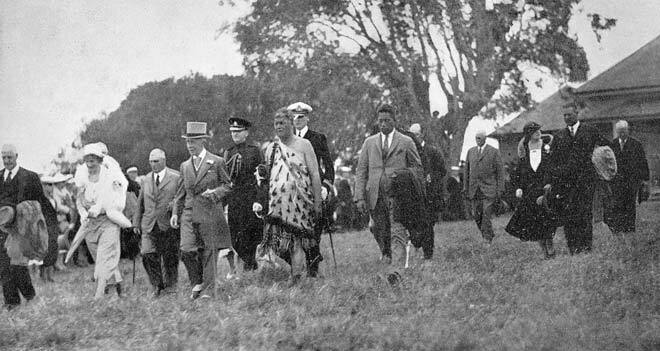 In 1934 commemorations began at the Treaty Grounds at Waitangi after Lord Bledisloe (in the top hat) and his wife Alina (wearing a fur stole) gifted James Busby‘s residence, where the treaty had been signed, to the nation. 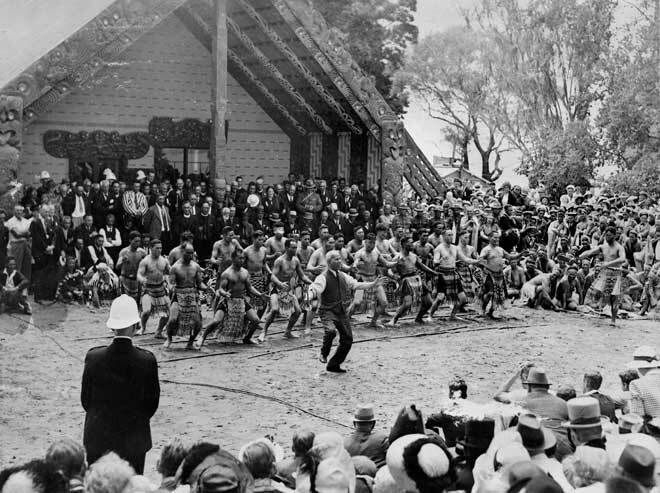 For the centennial celebrations in 1940 a meeting house, Te Whare Rūnanga, was built to commemorate the 100th anniversary of the signing of the Treaty of Waitangi. The centennial is often depicted by an iconic image of Āpirana Ngata leading the haka in front of the meeting house at Waitangi (below). Not all was well, however, with Waikato and Taranaki tribes boycotting the occasion. Waitangi Day has only been a national holiday since 1974, when it was also renamed New Zealand Day. The renamed day did not sit well with many and it was changed back to Waitangi Day in 1976 and has been so since. Protests from the 1970s though into the 1980s were common. 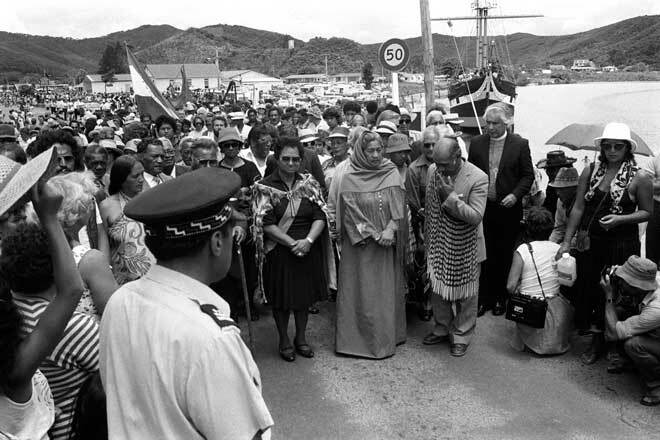 The 1984 hīkoi to Waitangi was one of the more well-known. 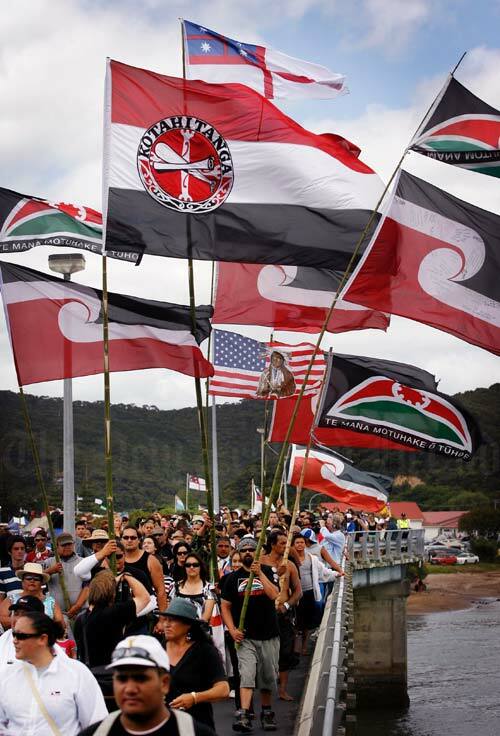 Politicians and royalty have felt the sting of protest at Waitangi. This Wednesday promises the possibility of continued protest. 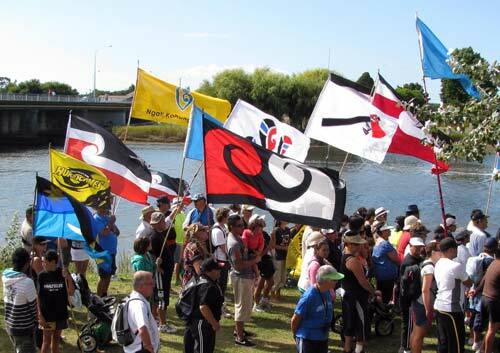 But inevitably – depending on the weather – there will be numerous community events around New Zealand, like this Ngāti Kahungunu-run Waitangi Day event in Hawke’s Bay (below) – where the local community will get together for the day. Waitangi Day, love it or loathe it, there’s never a dull moment.